Providing a thorough introduction to current philosophical views on morality, Normative Ethics examines an acts rightness or wrongness in terms of such factors as consequences, harm, and consent. 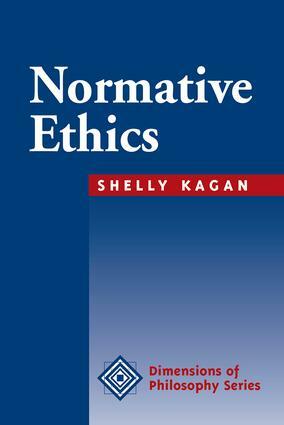 Shelly Kagan offers a division between moral factors and theoretical foundations that reflects the actual working practices of contemporary moral philosophers.Intended for upper-level or graduate students of philosophy, this book should also appeal to the general reader looking for a clearly written overview of the basic principles of moral philosophy. }Providing a thorough introduction to current philosophical views on morality, Normative Ethics examines an acts rightness or wrongness in light of such factors as consequences, harm, and consent. Shelly Kagan offers a division between moral factors and theoretical foundations that reflects the actual working practices of contemporary moral philosophers. The first half of the book presents a systematic survey of the basic normative factors, focusing on controversial questions concerning the precise content of each factor, its scope and significance, and its relationship to other factors. The second half of the book then examines the competing theories about the foundations of normative ethics, theories that attempt to explain why the basic normative factors have the moral significance that they do.Intended for upper-level or graduate students of philosophy, this book should also appeal to the general reader looking for a clearly written overview of the basic principles of moral philosophy.